Ok! By now you know I have a culture crush on TRON: Legacy and judging by the number of Twitter followers I have lost directly related to TRON tweets I’ll be winding down my hyping up of one of the best, big releases we have had this year. But not before posting about my visit to Flynn’s Arcade. The original TRON had its faults but my love of it grew over the years and it inspired me to either follow a career in arcade ownership or computer graphics - I settled on the latter for awhile. Back in July of 2009 Disney unveiled a Flynn’s Arcade at Comic Con San Diego. 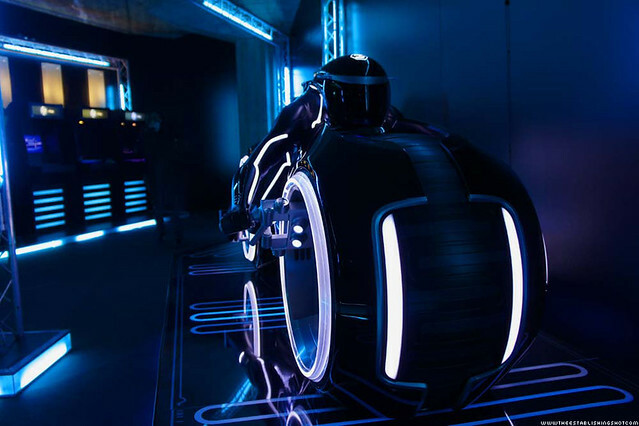 I was green with envy when I saw pictures and video of fans getting a chance to visit Flynn’s Arcade as well as get a first look at a real Light Cycle. Not for one second did I think that an Arcade or Light Cycle would make their way to our shores. And a Flynn’s Arcade token was more achievable. 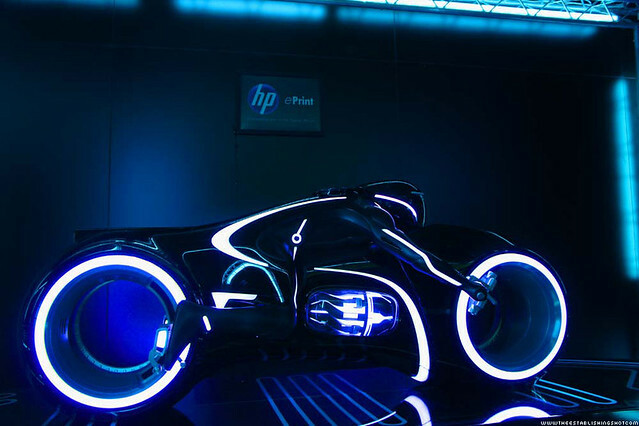 Tron yourself with HP ePrint. Love the movie? Want to be part of the Tron world? 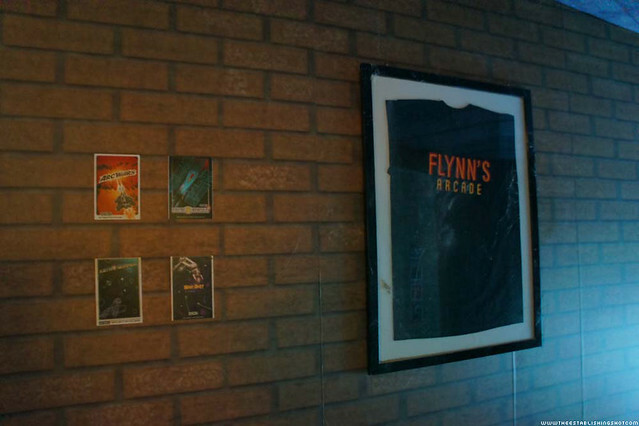 Step into Flynn’s Arcade and have an image taken of yourself to the backdrop of the iconic movie poster. By using your smart phone or getting one of the roving HP ePrint team to take your picture you can pick up your freshly printed image from the latest HP e-All-in-One printers as a pre-Christmas gift. 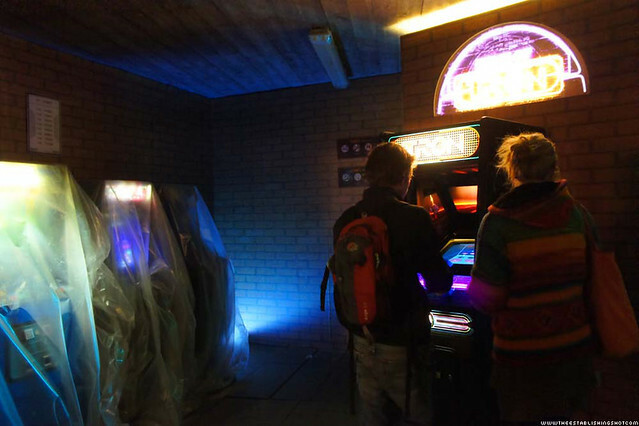 A reconstruction of Flynn’s Arcade – the portal to travel from the real world to the digital. Experience the landscape that the film’s main protagonist, Kevin Flynn, has created. 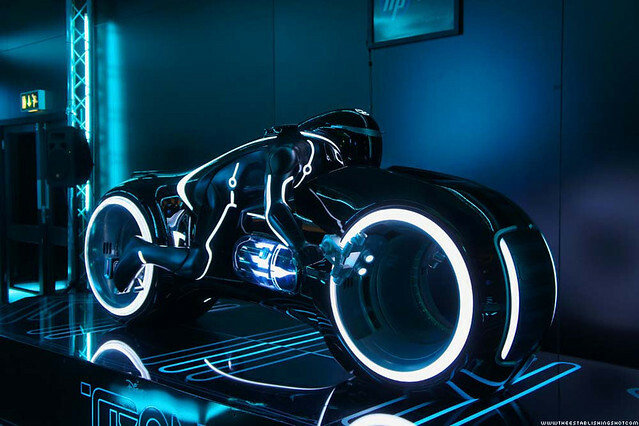 Play videogames, ride a replica of the famous Light Cycle vehicle from the film, learn about the Tron phenomenon, watch material from the upcoming Tron Legacy release and try the new HP ePrint experience. As soon as possible and braving the bitterly cold weather I made my way down to the Southbank to visit Flynn’s Arcade. 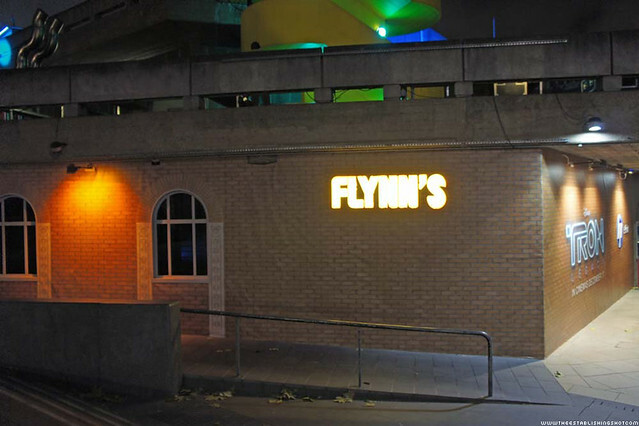 After a brief search and finally being guided by a blue beam (like the Bat Signal) high in the sky I found Flynn’s Arcade under the Queen Elizabeth Hall next to the Skate Park. 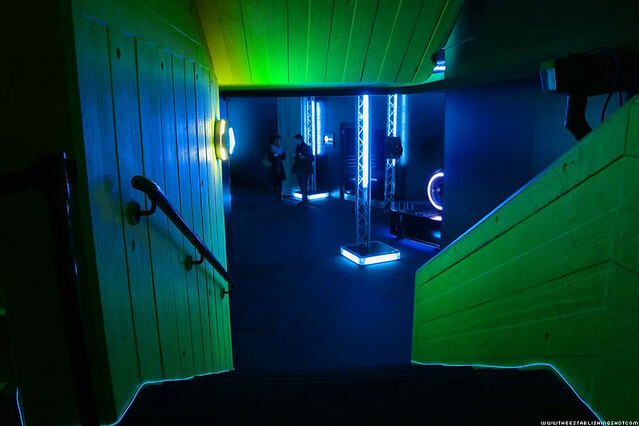 I made my way into the entrance, past the posters and stuck on notes just like a real Arcade, to be greeted by banks of arcade games and TRON memorabilia on the walls (T-shirts and the full set of Tron postcards from the Viral games). 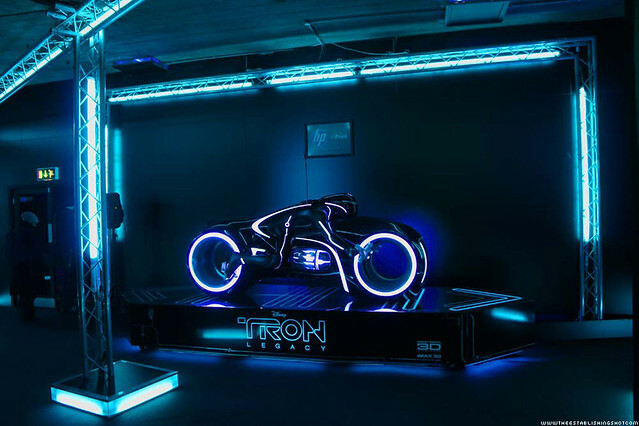 Following Tron styled strip lighting I made my way downstairs to a neon lit room, and there it was - a life size Light Cycle replica complete with a programme riding it. Sweet. It was beautiful. On the left there were a series of HP e-printers set up to print pictures taken at the Light Cycle. And on the right there was a unit showing the trailer and footage from TRON: Legacy & another game. I had just had my picture taken, it was emailed to the printer and we were waiting for the print out when the team let me know that the TRON Light show was about to start. Bonus! I thought I had missed the show, subsequently I have found out that the show ran every 10 mins when it was dark enough. Following the strip lighting I made my way to the roof and the bracing cold. I have to say HP organised an impressive set up. 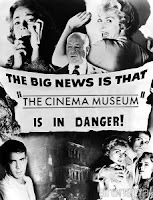 Multiple state of the art projectors with a booming sound system. Surrounded by the existing lights from the Southbank I have to say this was a great location for the light show. After the show I got chatting with Rob Slater, Director of Flat-e to find out more about the show. Turns out, Flat-e make films and animation for music promos, advertising, feature films and live events. 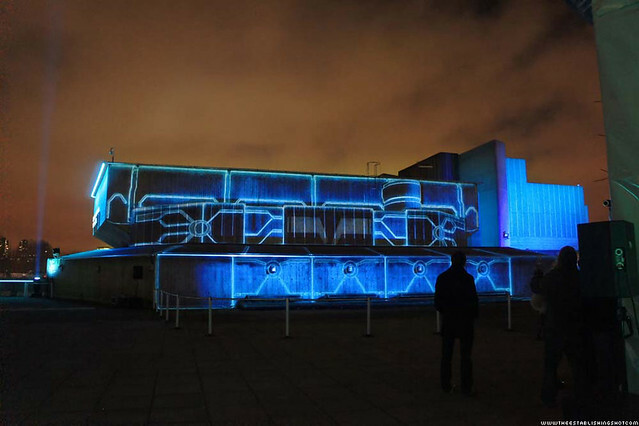 They collaborated with Seeper on the projection mapping of the TRON lightshow onto the Queen Elizabeth Hall. 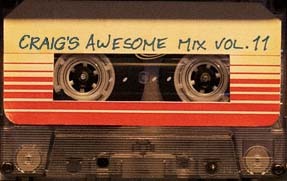 The audio was courtesy of Si Begg who mashed up Daft Punk’s soundtrack with his own styling to create the audio experience. I had intended to visit Flynn’s Arcade again and make a proper video unfortunately I didn’t get the chance too.